This Heavy Duty Commercial Wet/Dry Vacuum picks up dry materials as well as liquids. Mounted on a four-wheel cart with two(2) front swivel casters/wheels and a handlebar for easy maneuverability around any floors. The 17" (43 cm) floor squeegee is ideal for vacuuming liquids on large surfaces. Its brushes and crevice tool will get through dust, sawdust, stone dust, and leaves. The Bosch VAC090AH 9-Gallon Dust Extractor with Auto Filter Clean and HEPA Filter provides a complete package that is designed to help users move toward compliance with the OSHA silica dust regulation. The dust extractor delivers a maximum 150-cubic-feet-of-air-per-minute rate (CFM), with a sustainable 97 inch static water lift (maximum). The automatic on-board filter-cleaning system activates every 15 seconds to help maintain maximum suction power. The included HEPA filter captures 99.97% of particles at 0.3 microns and larger. The included fleece filter bag helps to protect the filter and provides the optimal containment of dry dust and debris. The dust extractor also has power tool activation that allows the tool to activate the vac and a Power Broker dial to match the suction force to application. High performance wet and dry vacuum cleaner with power tool connection for workshop and installation use with large set of accessories. High performance turbine for 151 cfm (71 l/s) flow rate and 98.4 of water lift. (245 mbar vacuum). Autostart outlet with power-on delay to prevent current spikes. Working on all Milwaukee 18V slide-on batteries, LITHIUM-ION or NiCd, the 0880-20 wet/dry vacuum offers long continuous run time and high air power and suction to provide quick and easy removal of dust, debris and water. A washable, reusable wet/dry filter delivers excellent fine dust collection and does not need to be changed between wet and dry applications. The stackable toolbox design, on-board hose and accessory storage offer excellent portability and convenience, a built-in blower port allows the vacuum to double as a blower, and the 1-" hose allows standard vacuum attachments to be fastened. It includes vacuum, filter, hose, a crevice tool, and a wide nozzle. The M18 FUEL Brushless Cordless 3-in-1 Backpack Vacuum brings unmatched performance, portability, and versatility to the jobsite cleanup category. A POWERSTATE Brushless Motor and cyclonic technology delivers up to 2X more suction than the competition, allowing users to clean up drywall dust, concrete dust, wood/metal shavings and other common jobsite debris quicker and more efficiently. A quick release removable harness with an integrated canister hook allows users to wear, hang, and carry the product for ultimate cleaning versatility on any jobsite. At only 76 dB(A), the vacuum is up to 3X quieter than a traditional jobsite vacuum, allowing for quiet operation in occupied spaces. As a part of the M18 System of tools, it is powered by REDLITHIUM battery packs, which deliver up to 25-minutes of run time on a HIGH DEMAND 9.0 Battery Pack in high mode, and over 40 plus minutes of run time in low mode. For added convenience, the 0885-20 empties debris at the click of button, reducing downtime when the canister is full and allowing users to get back to the task at hand. Whether you are doing spot, area, or final cleanups, the M18 FUEL 3-in-1 Backpack Vacuum can go anywhere on any jobsite to complete countless cleanup tasks. 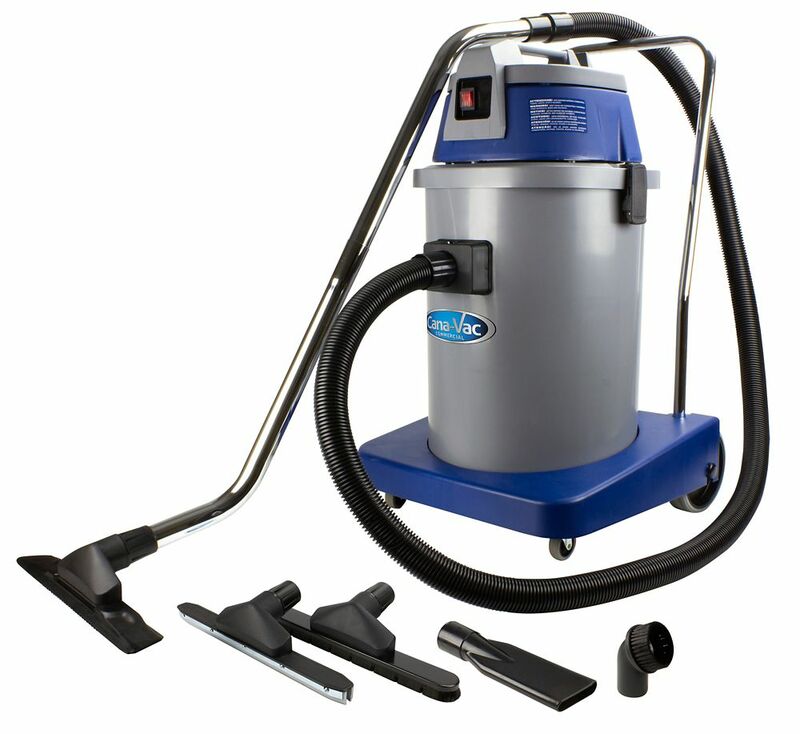 Wet & Dry Commecial Heavy Duty Vacuum Pro from Cana-Vac, 9 gal (35 L) Tank & Accessories This Heavy Duty Commercial Wet/Dry Vacuum picks up dry materials as well as liquids. Mounted on a four-wheel cart with two(2) front swivel casters/wheels and a handlebar for easy maneuverability around any floors. The 17" (43 cm) floor squeegee is ideal for vacuuming liquids on large surfaces. Its brushes and crevice tool will get through dust, sawdust, stone dust, and leaves.